Marcus Garcia has spent nearly two decades establishing some of the most committing and beautiful routes in North America. From cutting edge single-pitch climbs to daring 14-pitch adventures, on rock, ice and mixed terrain, the one thing that all of Garcia’s climbs have in common is the huge amount of work and passion required to create them. 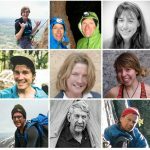 This article is brought to you by Osprey Packs. 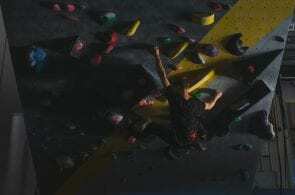 It was 1999, and Marcus Garcia was solo-aid climbing two rope-lengths up an unclimbed rock face in Mexico, as he forged a new line up the wall. 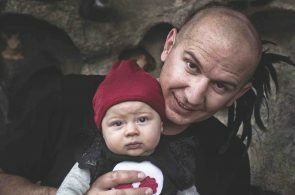 “Suddenly, I pull off a huge block and it hits me in the chest,” he remembers, “so now I’m falling, and my body is horizontal because the block is on top of me.” The solo-aid device failed to engage because of his inverted body position, and Marcus plummeted around 50 feet before he crashed through a palm tree, which righted him and allowed the aid-device to catch his fall. His souvenirs from the debacle included stitches on his arm, and a handful of cuts on his back and head. In “The Master and The Mentor,” a feature that appears in Rock and Ice issue 238, Jeff Jackson writes, “Marcus Garcia might be the best climber you’ve never heard of.” And Garcia is deserving of the the superlative: He has climbed 5.13 trad, attempted bold, ground-up free climbs on big walls, ticked cutting-edge ice and mixed routes, and done everything in between. But another, even less-known facet of Garcia’s career is the vast route development he has done over the years. “I would say I’ve put up maybe over 200 routes, including everything,” Marcus says. 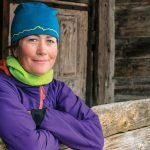 “I’m an all around climber—I do trad, sport, mixed, desert towers, big walls. Whatever.” This includes everything from single-pitch routes to 14-pitch adventure climbs. He started establishing routes around 1996 or 1997 by his recollection, with his late friend and mentor Jimmy Forrester. 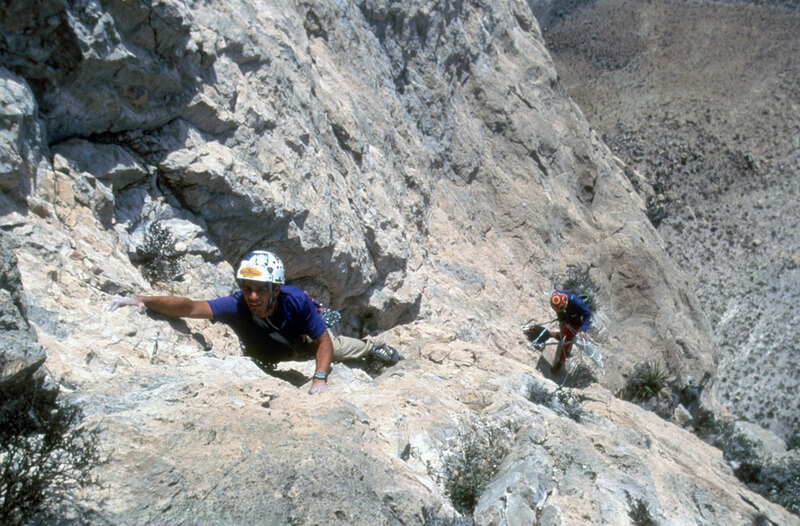 Marcus and Jimmy began with dozens of new lines in the Wichitas, Oklahoma, and El Potrero Chico, Mexico. 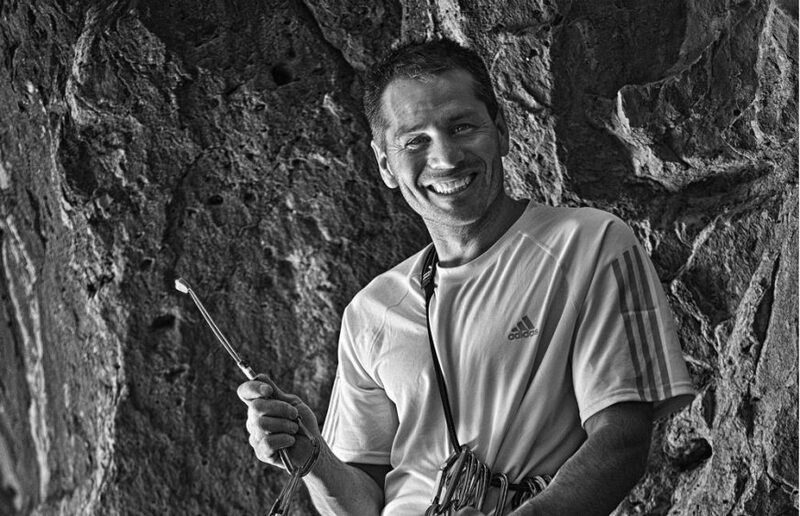 Garcia works a new route at Falcon Hatch, Utah. Photo: Marcus Garcia collection. 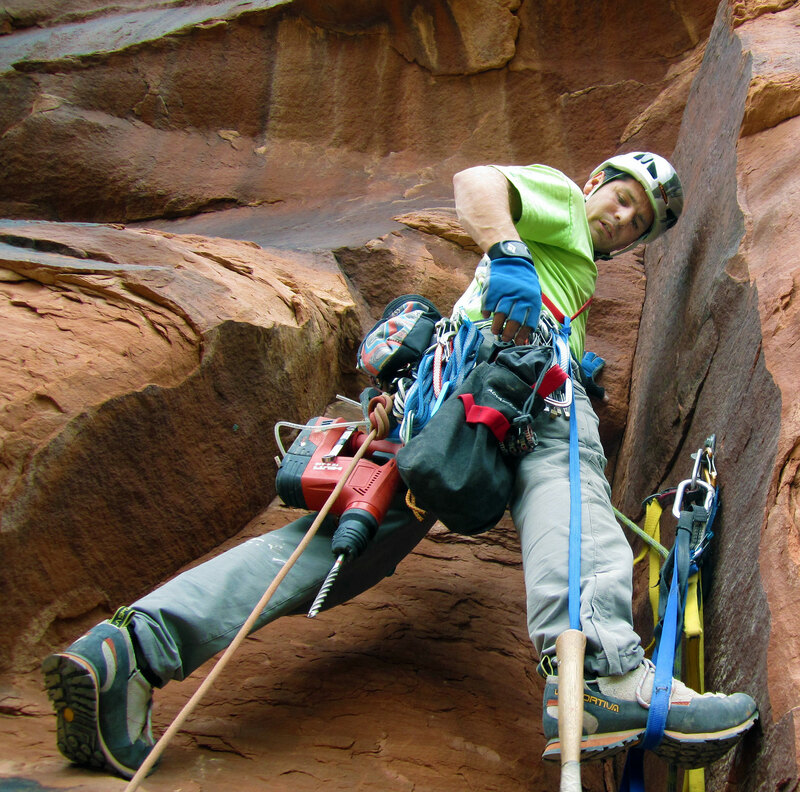 In Oklahoma, most of their climbs were on gear, as there was a bolting ban. “We’d go up with copperheads and stuff,” Marcus says, “all ground-up. That’s how I was taught.” There, he put up a number of dangerous routes, lines with heady grades like 5.13 R and 5.13 R/X. “No one has repeated those. I wonder why?” says Marcus, chuckling. In his two decades of development, he’s had more than a few close calls. He equips many routes ground-up, sometimes solo, employing aid techniques and placing bolts (when he places them at all) on lead, from hooks or tenuous stances. During one stint in Mexico, Marcus and his partner spent two weeks on a big, limestone wall establishing a new 11-pitch route. They brought a gas-powered drill with them for any bolts they’d need to place. 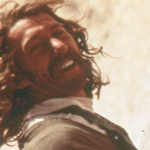 Garcia runs it out and hand-drills a bolt on lead while establishing a new route in the desert. Photo: Marcus Garcia collection. Route development takes a lot more than an appetite for risk and objective danger, though, according to Marcus. “A lot of people don’t understand what it takes,” he says. 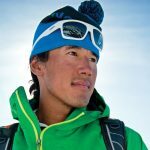 “Everyone wants to complain, but no one wants to say ‘Hey, good job, thanks for putting in all that work.’” A single route requires $50-60 worth of hardware, he says, in addition to the time commitment, sometimes days or weeks, of scoping out the area, cleaning the route and equipping it. Marcus Gacia new-routing in Mexico. Photo: Marcus Garcia collection. Asked about other lines he’s put up in the past, it’s as if Marcus is flipping through a rolodex of memories, suddenly landing on good or hard routes, climbs for which he has idiosyncratic little stories, or just routes that for some reason or other he has a particular fondness for. He mentions The Matrix, in Durango (“It has only had two ascents in like six years. Probably about 13+.”); The Corrections, also in Durango (“It’s like 13+ or so. Trad at the beginning and then this old aid route that we freed.”); Spanish Harlem, in Mexico (“We did that all ground-up over a two week period. It’s out on a wall called La Popa. Mostly trad. It’s like 5.13 R. Some sections we decided to just not put bolts in because it was just 5.8 R—you’d get a piece after like 100 feet of climbing, stuff like that. 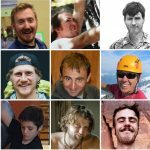 Still no second ascent.”); and many others. 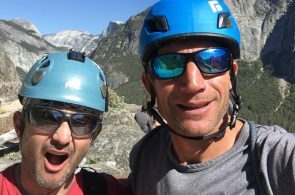 Just as the names he affixes to his routes have meaning, the routes themselves are more than climbs for Marcus: they are a lifetime of learning and striving, of experiences and friendships. 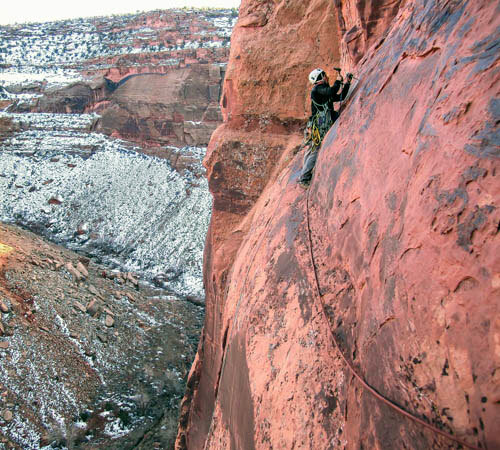 Marcus, who is now 41, still climbs at an extremely high level, but nowadays, he says, he “likes putting up routes that other people will enjoy as well.” In recent years he’s been working on a new area just north of Indian Creek, Utah. He still prefers to go ground-up, like he was first taught, when possible. Most of the routes at this new spot are three pitches, some even longer. “I try to put a new route up every year,” he says.